One of the great mantras of paleontology is "wait for the paper" (occasionally with choice adjectives between "the" and "paper"). Paleontology is, after all, a science of delayed gratification. 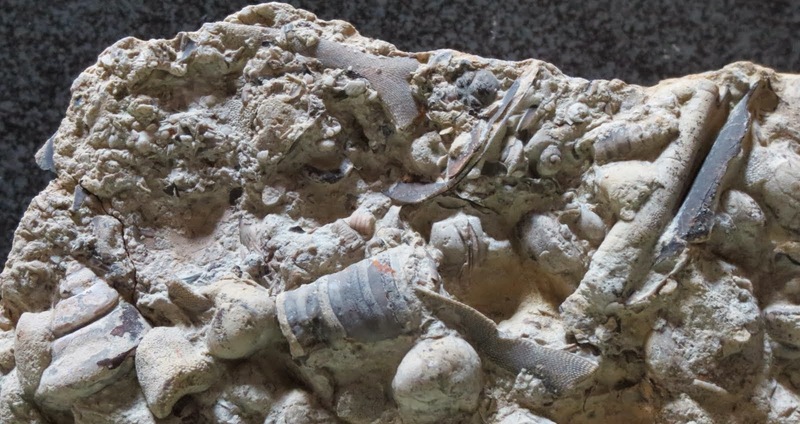 First you have to find the fossils, then prepare them, then write and submit a manuscript, and then see it published. This process is measured in years in the best of times, and often some information gets out, either intentionally (talks, posters, news releases) or unintentionally (unredacted information in other publications, gossip, etc.). We went over part of this ground before. Here's a group of concrete examples. Near the end of the book, there is a fascinating section titled "Addendum II" that covers a grab bag of preliminary research. Given that the book is 33 years old, one would suspect that most of the addendum has been dealt with. Most of it indeed has, but some parts are still outstanding. I'd started by dealing with the whole addendum, but it got to be too long, so I chopped it into theropods, sauropodomorphs, and ornithischians. I've refrained from quoting entire sections, instead summarizing the main thrust of each item. The "Cape Patterson [sic, Paterson] allosaur" of Australia: the Australian Allosaurus is a classic 1980s–2000s dinosaur meme. It is known from an astragalus (primary dinosaurian ankle bone, affixed to the tibia), and has also traveled under "Allosaurus robustus" and the "polar" or "dwarf allosaur", under which guise it made an appearance in Walking with Dinosaurs. The interest is obvious: Allosaurus is an Upper Jurassic dinosaur from North America, whereas the bone is from Lower Cretaceous rocks of Australia. Unfortunately, it's difficult to do much with one astragalus, so this animal will likely remain without a name. Current thought suggests it either represents a megaraptoran like (or the same as) Australovenator (Hocknull et al. 2009), or an abelisaur (Agnolin et al. 2010). Gilmore's "Chirostenotes" jaws: this one's easy: Richardoestesia, named in 1990 (a.k.a. Ricardoestesia, for those of you arriving from the 1990s). 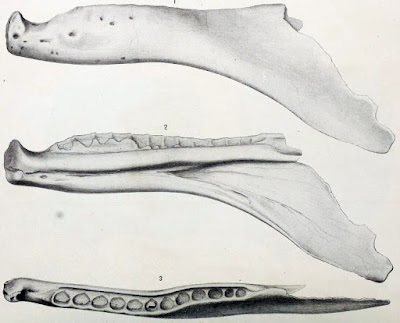 Richardoestesia has a long history of denying paleontologists its postcranium, leaving only teeth and the above-mentioned jaws; perhaps it was actually a terrestrial conodont. A tiny coelurosaur from Fruita: this turned out to be the same thing as the Fruita fabrosaur, mentioned later in Addendum II. The Fruita fabrosaur was finally named in 2010 as Fruitadens, a heterodontosaur. A possible dromaeosaurid from the Nemegt: there's not a lot of detail with this one. One clue is that it was mentioned by Osmólska (1978), but I haven't been able to find any such publication. I suspect this is an early reference to Bagaraatan, described in 1996, which will no doubt turn out to be a juvenile Tarbosaurus any day now. Lagosuchus and Lagerpeton are mentioned as possible saurischians: as it turned out, this wasn't too far off the mark, but they are actually more basal than true dinosaurs, although close relatives. Wyleyia, Heptasteornis, and Bradycneme as dinosaurs, not birds: the basic point is a bit "small beer" now that birds are firmly ensconced within dinosaurs, but it is now agreed that these three genera represent non-avian dinosaurs (even if people can't agree on exactly what kind of non-avian dinosaurs they were). The end of the paragraph mentions what will become known as Avisaurus and the vanguard of Entantiornithes, one of the most successful groups of Cretaceous birds. A pelvic girdle and limb bones of a theropod from the Kallamedu Formation of India: this is doubtless Bruhathkayosaurus, better known as one of the great "white whales" of dinosaur paleontology, a rare form whose bones turned to hype instead of more typical minerals. (Hype is very susceptible to erosion and disintegration, so unsurprisingly the bones are no longer extant. Compare Amphicoelias fragillimus.) The reported bones are the same as those thought to exist for Bruhathkayosaurus, and the formation is correct as well. "Gorgosaurus" novojilovi: another small tyrannosaurid that turned out to be a juvenile Tarbosaurus, after spending time as Maleevosaurus. Two paragraphs on various track genera that had been described as birds, but were now being reconsidered as dinosaurs: not much to say here, just seems like an oversight in study. A pelvic girdle from Khara Khutul, belonging to the "segnosaurian indet": this is Enigmosaurus, named in 1983. Before the mid 1990s or so, Enigmosaurus was somewhat more prominent on the dinosaur landscape. Now, with many other therizinosaurs known from much better material, it's just kind of there. A bird-like theropod from the Nemegt to be described by Kurzanov: this is Avimimus, named in 1981, which is included more formally a few pages later as one of the last things to get into the book. All in all, the theropods turned out pretty well. Most of these reports have been resolved, even if years or decades have elapsed. Some that haven't, like the Australian allosaur or "Labrosaurus" ferox, are based on limited material that will probably continue to elude being nailed down. The only one I'm really unsure about is the report of Kota Formation theropods. Agnolin, F. L., M.D. Ezcurra, D. F. Pais, and S. W. Salisbury. 2010. A reappraisal of the Cretaceous non-avian dinosaur faunas from Australia and New Zealand: evidence for their Gondwanan affinities. Journal of Systematic Palaeontology 8(2):257–300. Gilmore, C. W. 1920. Osteology of the carnivorous dinosauria in the United States National Museum, with special reference to the genera Antrodemus (Allosaurus) and Ceratosaurus. Bulletin of the United States National Museum 110:1–159. Paul, G. S. 1988. Predatory dinosaurs of the world. Simon & Schuster, New York, New York. Also, Stygivenator was named by Olshevsky (1995), not Olshevsky (1991). Great article! Thank you! I have made the correction.